This year our Easter was the closest to 100% homemade as we've gotten! For the first time ever we didn't buy a single hot cross bun from the shops, instead I baked up a storm for nearly the whole of March, trying and refining hot cross bun recipes to find the one that we love. Which we did - using white spelt flour, rice malt syrup, loads of spice and a good handful of organic sultanas. Delicious! If you've ever looked at the ingredients on supermarket hot cross buns you were likely as horrified as I was - vegetable oil, loads of sugar, emuslifiers and preservatives. Let me tell you it does not have to be that way! 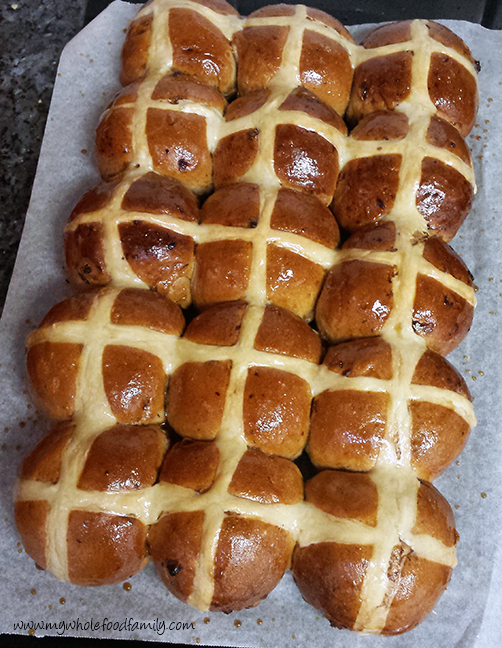 Making your own hot cross buns is easier than you might think and a great activity to get the kids involved with (my recipe is scrawled in a notebook but I will get it on the blog when I can, hopefully sometime before next Easter!). The Easter Bunny brought our boys some lovely winter pyjamas and a single dark chocolate Lindt Bunny. This was the only commercial chocolate the boys received as we had requested non-choc gifts from relatives. Everyone awesomely obliged and boys were gifted board games, books and some rabbit ornaments. We also did an Easter Egg hunt this morning with the boys searching for plastic eggs with little chickens inside and I love that they loved the experience of the hunt so much they didn't notice there was no chocolate involved! Our junk food philosophy can be summed up as 'party food is for parties' (borrowed from Sweet Poison by David Gillespie) meaning we don't stop the boys eating anything but we clearly treat it as sometimes food and we don't have it in the pantry. The boys all wanted to eat their chocolate for breakfast but unlike the other two, Mr 5 scoffed the lot before 7am and then felt so sick for most of the day that he has refused all other chocolate and can't even stand the smell of it. He usually doesn't have an off-switch when it comes to sweets so perhaps this has been an effective lesson for him! I'm interested to see how long the aversion will last and whether it will affect how much chocolate he eats on other occasions. We also didn't purchase any chocolates for each other or for family but instead experimented with some homemade treats. Our homemade chocolates were made using Quirky Jo's dairy-free raw chocolate, Alexx Stuart's real marshmallow and Against All Grain's mandarin truffles. This was my first time using cacao butter to make real wholefood chocolate and I was so impressed with how easy it was to use and how delicious the results were. The marshmallow was out of this world and although obviously it contains sugar (rice malt syrup) it's so much cleaner than the bought stuff. I will be playing around with different flavours and ingredients for Christmas gifts too. I have such fond memories of making chocolates with praline, nougat, marshmallow and cream fillings for Easter and Christmas with my mum. I still have all these moulds and loved digging them out to use with my boys. Making memories and delicious food like this really is at the heart of what My Wholefood Family is all about.